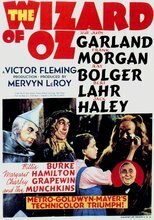 Kansas twister lifts Dorothy and her dog Toto into the fantasy land of Oz, where she meets up with a series of oddly deficient characters journeying on the Yellow Brick Road to the Emerald City. There they encounter the Wizard, who makes the deficient whole again, but all Dorothy seeks is a way home. The greatest fantasy film ever made; more people have watched this than any other film.